Orange Co. • Riverside Co. • San Bernardino Co. Welcome to Affordable Awnings Company, Rialto's trusted provider of custom-made awnings for homes and businesses for over a decade. We manufacture and install beautiful, long-lasting, highly-functional awnings that perfectly complement the look of your property. Our innovative shade and design solutions beautify your outdoor area while providing increased sun protection and cooling comfort. We take great pride in our exceptional workmanship and affordable rates, which have earned us thousands of customers and an A+ rating from the Better Business Bureau. 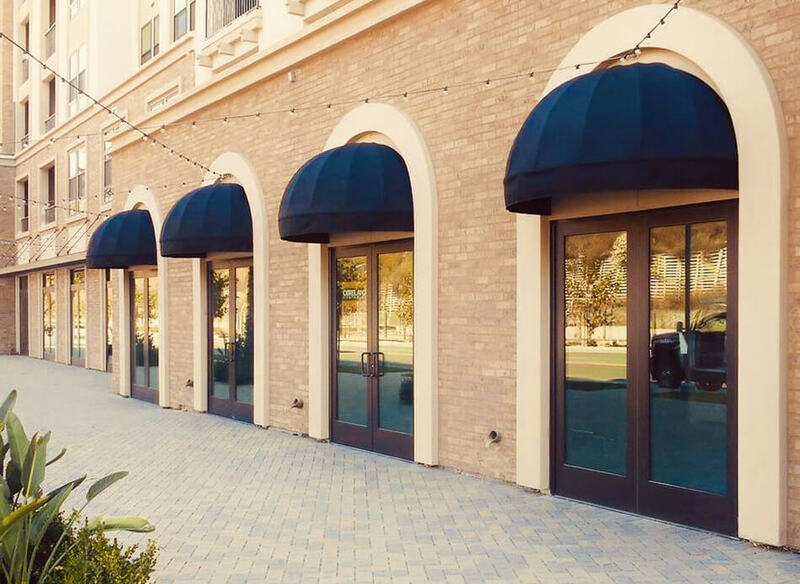 As a full-service awning company, our experienced specialists can assist you with any awning project, including manufacturing, production, installation, repair and recovering services. Whether you're looking to install a new awning or recover your old one, we always use the highest quality materials, such as powder coated steel frames and Sunbrella fabrics, giving you the best value for your investment. Our Sunbrella fabrics are even covered by a 10-year warranty. We can custom-design your awning, or you can choose from our extensive selection of styles, shapes, and sizes. We carry over 100 different fabrics with solid or striped designs in a range of color combinations. Our awning products also include manual and electric retractable awnings, stationary awnings, window awnings, canopies, cabanas, aluminum wood, patio covers, drop rolls, sunscreens, balcony awnings, outdoor curtains, umbrellas, sail shades and custom graphics. Our knowledgeable staff are ready to assist you with all your awning needs. Affordable Awnings Company is fully insured, licensed and bonded. For more information and a free estimate on awnings in Rialto, call today. Our well-known reputation for excellent workmanship, unmatched customer service, and affordable rates has made Affordable Awnings Company Rialto's top choice for quality, custom-made retractable awnings. Our attractive and durable retractable awnings will cool, protect & beautify your outdoor space, in addition to increasing the value of your Rialto home or business and reducing your air conditioning usage. We offer manual and motorized retractable awnings and only use premium materials such as powder coated aluminum frames and Sunbrella fabric. 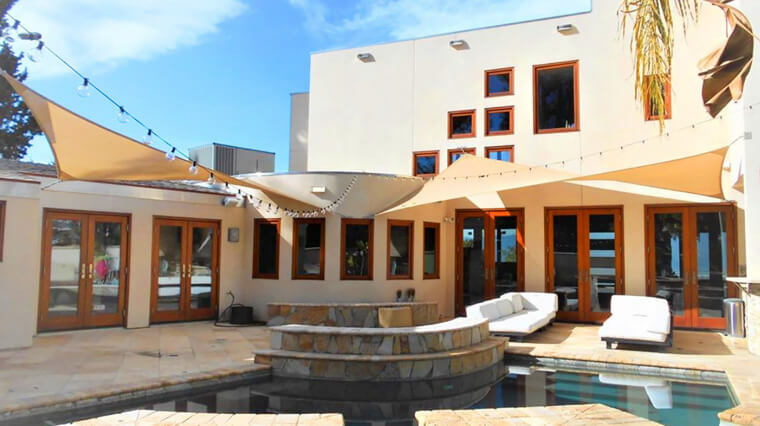 Our awning experts will install a retractable awning that complements the exterior design of your property, custom made to your exact specifications. Retractable awnings can be designed to span any width and can project out to 13 feet. Our motorized awnings open and close smoothly and quietly, and can be modified to automatically respond to environmental conditions. Our Sunbrella fabric options are each backed by a 10-year warranty, and they come in a wide selection of designs, including over 140 colors, stripes and patterns. They can even feature high quality custom graphics. In addition, we offer 12 valance styles and an awning hood option for maximum protection against the elements. To get a free estimate for retractable awnings in Rialto, call today. Affordable Awnings Company is Rialto's best value for high quality, custom-made fixed awnings that cool, protect & beautify the outdoor space of your home or business. Our experienced specialists will help you choose the best awning solution to complement your window, door, deck, patio or balcony, then professionally install your new fixed awning. We provide a complete selection of fixed frame awnings that can be designed to span any width and projection, including traditional, patio, dome, rounded entrance and flat-faced marquee awnings. For long-lasting results we use only the most durable materials, such as powder coated steel frames, premium thread and Sunbrella fabric. Sunbrella fabric comes in over 140 colors, stripes and patterns, and is backed by a 10-year warranty. All of our awnings can be modified to include custom graphics or one of 12 valance choices, making them ideal for commercial branding and high visibility. To get a free estimate for fixed awnings in Rialto, call today. Affordable Awnings Company is Rialto's best value for high quality, custom-made awnings that beautify and shield your windows from the elements. Our window awnings provide maximum shade coverage for enhanced comfort and added elegance, while also significantly reducing your air conditioning usage. Whatever the size or shape of your windows, our awning specialists can custom design your awning to meet your specifications and even complete installation within one day. We use only the finest American-made materials, such as powder coated steel frames, premium thread and luxurious Sunbrella fabrics. These water, fade and mildew resistant fabrics are available in over 140 colors, stripes and patterns, and are backed by a 10-year warranty. We offer a wide variety of options to suit different needs, such as fixed window awnings, manual or motorized retractable window awnings, environmental sensor features, 12 styles of valances, awning hoods, and custom screened graphics. To get a free estimate for window awnings in Rialto, call today. Affordable Awnings Company performs expert awning recovers in Rialto. Our professional techniques and high quality materials ensure that your awning will look like new at a fraction of the price of a new installation. With solutions to fit most budgets, our high quality, custom-made recovers will extend the life of your awning for years to come. Awning recovers are a cost-effective way to renew the look of your old, worn or damaged awning. Our skilled technicians will assess your existing awning structure and provide a professional recommendation for an awning recover, guiding you through our extensive selection of fabric choices. Once you approve the estimate, we will promptly manufacture your custom recover. We use only the best American-made materials for unmatched durability, such as premium thread and Sunbrella fabric. Sunbrella's fabrics come in over 140 designer colors, stripes and patterns, and are backed by a 10-year warranty. We also offer 12 styles of decorative valances for added elegance, and we can create custom graphics for your commercial awning to enhance visibility and branding. To get a free estimate for awning recovers in Rialto, call today. Affordable Awnings Company is Rialto's best value for custom-made, high quality, fixed and retractable aluminum window awnings. Our durable, attractive and cost-effective aluminum window awnings enhance the exterior design of any home or business, while shielding your windows from the elements. They can be custom-designed to your specifications, and we offer a wide selection of awning colors. We use only the highest quality materials, such as powder-coated aluminum frames, which are water-repellent, mildew-resistant and rustproof. Affordable Awnings Company's aluminum window awnings are a great value and a good investment; they will keep your Rialto home or business cool, reduce air conditioning costs, and protect your furnishings from sun damage. To get a free estimate for aluminum window awnings in Rialto, call today. At Affordable Awnings Company, we custom design and manufacture attractive, high quality drop rolls and sunscreens for Rialto homes and businesses. Our awning experts will help you choose a customized sunscreen or drop roll that meets your shading needs and budget. Sunscreens help save you money on energy costs by reducing the heat transfer through your windows. They protect your indoor furnishings from fading, and provide privacy without blocking views. They also reduce glare and block harmful UV rays, allowing for a more comfortable environment indoors. Drop rolls also provide maximum protection from the sun, as well as from the wind and rain, and are designed for larger areas such as patios and decks. We will manufacture your sunscreen or drop roll to meet your specifications. These types of screens are all retractable, and can be fitted with a manual pulley or crank, or a motor for convenient remote or sensor control. We use only premium-grade materials to endure repeated rolling up. Our frames are made with powder coated aluminum and innovative fabrics that can cool your outdoor space by 20 degrees or more and reduce your air conditioning costs by 25-40%. We offer 70 and 90 percent mesh fabrics, ideal for blocking sunlight and keeping out insects, as well as quality Sunbrella fabrics, which come in over 140 designs and block 100% of the sun's harmful rays. Sunbrella fabrics are backed by a 10-year warranty, and our motors, electronics and frames all carry a 5-year warranty. To get a free estimate for drop rolls and sunscreens in Rialto, call today. Affordable Awnings Company offers custom-made outdoor curtains that will transform your outdoor entertaining area and extend your residential or commercial space in Rialto. Our affordable, stylish and durable curtains keep outdoor spaces cool in the summer and warm in the winter. Our outdoor curtains can be used for patios, canopies, cabanas, decks, or gazebos, and we can manufacture your curtains to your exact specifications. To ensure long lasting results, we use only the finest American-made materials, such as Sunbrella's luxurious, durable fabrics, which come in over 140 designs and are backed by a 10-year warranty. To get a free estimate for outdoor curtains in Rialto, call today. Affordable Awnings Company is Rialto's best value for high quality, durable Aluminum Wood patio covers that allow you to enjoy the look of a wood patio cover without the cost and maintenance of wood. Aluminum wood patio covers extend your outdoor living space, and they can provide protection from the elements in addition to adding value to your home. The resilient aluminum wood surface also provides protection against fading, chalking, cracks and termites, without ever rusting, burning, peeling or warping. Our experienced specialists will create a custom design that meets your needs and budget, and can even complete the installation within one day. Affordable Awnings Company manufactures durable, custom-made fabric and aluminum patio covers and carports for Rialto homes and businesses. Our stylish, affordable and long-lasting patio covers and carports can help cool, protect & beautify your driveway, parking lot or patio. Whatever the size or shape of your outdoor space, we can custom design a cost-effective solution to meet your specifications and even complete the installation within one day. We use only the highest quality American-made materials, such as powder coated aluminum frames and high quality fabric. Our aluminum patio covers and carports are available in a tasteful, heat-deflecting white color that complements any building's exterior design. If you prefer a fabric carport or patio cover, you can choose from our extensive selection of durable, attractive Sunbrella fabrics, which includes over 140 colors, stripes and patterns. These water, fade and mildew resistant fabrics are backed by a 10-year warranty, and can be personalized with long-lasting custom graphics. To get a free estimate for fabric and aluminum carports and patio covers in Rialto, call today. Affordable Awnings Company manufactures high quality, custom-made cabanas that will transform your outdoor space for an affordable price. Cabanas provide cooling shade for year-round entertaining in a stylish structure, and are perfect for a clubhouse, spa room or lounge. We offer a wide selection of attractive cabana structures and designs, and we can install decorative curtains for additional style and privacy. We use only premium-grade materials, such as powder coated steel frames and 100% acrylic Sunbrella fabrics, which come with a 10-year warranty. To get a free estimate for cabanas in Rialto, call today. Affordable Awnings Company is Rialto's best choice for attractive, high quality sail shades that will enhance your residential or commercial outdoor space while reducing temperatures in the shaded area by 20 degrees or more. We custom make every sail shade to your exact specifications and can complete installation within one day. Our experienced shade specialists will guide you through our extensive selection to find a solution that perfectly complements your home or business. Our sail fabrics are available in a wide variety of colors and block up to 95% of harmful UV rays. We use only durable, premium-grade materials, including the highest quality fabric and steel posts, to ensure that your sails retain their beauty and functionality for years to come. To get a free estimate for sail shades in Rialto, call today. Affordable Awnings Company provides our Rialto customers with high quality custom graphics for awnings, umbrellas and more at affordable rates. Our attractive, eye-catching graphics are perfect for any business looking to enhance their storefront and strengthen their branding. The long-lasting results of your Affordable Awnings Company custom graphic is a smart investment that comes at a great value for your business. Our experienced graphics experts will work with you to design an effective, customized image that truly represents your business. We use a state-of-the-art technique to print business names, logos and designs on durable Sunbrella fabric, so your graphic stays sharp and vibrant for years to come, even under the harshest sun exposure. To get a free estimate for custom graphics in Rialto, call today. I had to replace my old awning before selling the house and called your awning company to do the job. I was so impressed with the professionalism and overall craftmanship! The new awninggreatly increased the value of my house and it was all . . .